Easily remove heavy imperfections while leaving behind a great finish! Premium medium to heavy cutting polish, that finishes down extremely well! 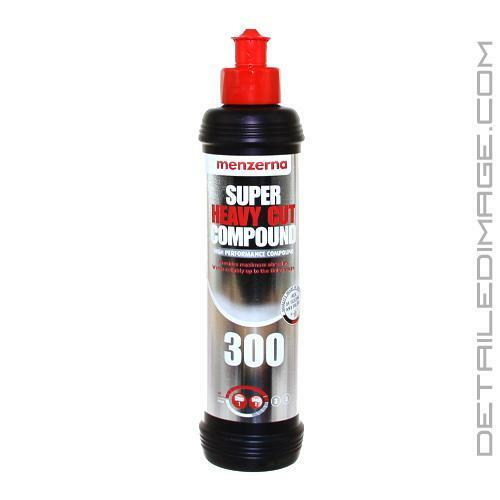 Menzerna Super Heavy Cut Compound SHCC 300 will allow you to remove medium to heavy imperfections (swirls, fine scratches, heavy oxidation, watermarks, etc.) while simultaneously leaving behind a great finish! SHCC 300 uses the same technology found in the popular FG 400, while featuring additional polishing power to help remove even deeper imperfections with ease. What makes this polish even better is after removing these heavy imperfections, you should only need one follow up polish to finish the paint down to a brilliant gloss. This eliminates the need for an intermediate step, allowing you to finish your polishing procedure in only two steps instead of three! Menzerna recommends following up SHCC 300 with the FF 3000 or SF 4000 for that mirror finish we all strive for. Save time and effort by cutting down your polishing steps with the Menzerna Super Heavy Cut Compound SHCC 300! Works reliably up to the finish stage. As always Menzernas polishes work as advertised. 300 has that extra cut for deeper imperfections that 400 can't quite remove. Really great polish.